Travis Wood and the rest of the Cubs pitchers are starting to turn the ninth spot in the batting order into a productive part of the lineup.Wood hit a fourth-inning grand slam off Jake Peavy and allowed two runs in six innings to lead the way in an 8-3 victory over the White Sox at Wrigley Field on Thursday. “Our whole staff has been hitting,” Wood said, after his grand slam gave Cubs pitchers 19 RBIs for May, a National League record for one month according to the team. “We take pride in our hitting, being able to help ourselves out, just being able to handle the bat. Wood wasn’t the only Cubs player hitting home runs against the White Sox on a day with the wind blowing out 24 mph.Nate Schierholtz and Luis Valbuena each hit their sixth home runs of the year in an 11-hit effort by the Cubs offense, keying a fourth straight win overall and third consecutive convincing victory over their crosstown rivals.However, it was Wood (5-3) who broke open the game with his fifth career home run and second this year in the fourth inning with the Cubs leading 2-1. Welington Castillo and Valbuena started the fourth inning with singles and Jake Peavy hit Darwin Barney before Wood’s grand slam on a 2-1 pitch. It was the first grand slam by a Cubs pitcher since Jason Marquis hit one Sept. 22, 2008, in New York against the Mets and first by a Cubs pitcher in Wrigley Field since Burt Hooton hit one Sept. 16, 1972, against the New York Mets. The last time any team’s pitching staff had more than the Cubs’ total of 19 runs batted in for a month was 1940 when the Detroit Tigers had a month with 20.Peavy (6-3) allowed six earned runs and eight hits in four innings. He also gave up four straight hits in the second inning for two runs that put the Cubs ahead for good as they went on to clinch this year’s Crosstown Cup – the first time they’ve won the series since 2007.It was Peavy’s worst start since giving up six runs April 9 at Washington in 5 1/3 innings. With two outs in the second, Valbuena doubled, Barney singled him home, Wood singled and David DeJesus singled in Barney for a 2-0 Cubs lead.Schierholtz homered leading off the fifth against reliever Nate Jones for a 7-1 lead and Valbuena hit a leadoff homer off Brian Omogrosso in the eighth. Paul Konerko drove in the first two White Sox runs, one with a third-inning, two-out single and the other on a double in the sixth after Alex Rios had doubled. Alejandro De Aza drove in the final run with a ninth-inning single.The White Sox came into the series at .500 (24-24) for the first time since April 8 after winning five of six games. NOTES—The Cubs called up right-hander Zach Putnam from Triple-A Iowa and sent down right-hander Alex Burnett, a former Baltimore pitcher whom they signed off waivers Monday. Putnam had one inning of scoreless relief….A day after hitting three home runs in one game, Cubs catcher Dioner Navarro was back on the bench with starting catcher Welington Castillo in the lineup….The Cubs came into the game with the third-most errors in the NL (39) and the White Sox with the most in the AL (35), and both teams committed errors in the first inning. 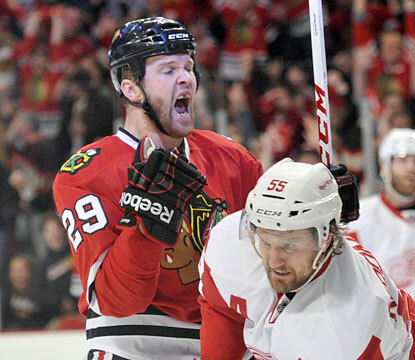 Seabrook’s OT winniner send Hawks past Wings 2-1, L.A. next in Western Conf Finals. Brent Seabrook sent a wrist shot past goalie Jimmy Howard’s glove 3:35 into overtime to give the Blackhawks a 2-1 victory over the Detroit Red Wings in Game 7 of their second-round playoff series on Wednesday night.The Blackhawks, who had the best record in the NHL regular season, rallied from a 3-1 series deficit to reach the Western Conference finals against the defending Stanley Cup champion Los Angeles Kings.For just the second time in NHL history, the final four teams remaining in the playoffs are the four most recent Stanley Cup winners. The Blackhawks captured the Cup in 2010.Seabrook picked up a loose puck and skated in on Howard through the middle of the ice, with Detroit defenseman Niklas Kronwall in front of him. His shot hit Kronwall’s leg before it sailed into the left side of the net for the defenseman’s first goal of the postseason. The sellout crowd of 22,103 roared as Seabrook skated over to the boards and was mobbed by his delirious teammates. Howard put his arm around Kronwall, who was down on one knee, and tried to console him while the Blackhawks celebrated. It was quite a change from the end of the third period, when the Blackhawks thought they had scored the go-ahead goal. But it was waved off with less than 2 minutes remaining by referee Stephen Walkom, who called a pair of penalties behind the play.Patrick Sharp had given the Hawks a 1-0 lead in the second period.Henrik Zetterberg tied it in the third for No. 7 Detroit, which beat second-seeded Anaheim in seven games in the first round. 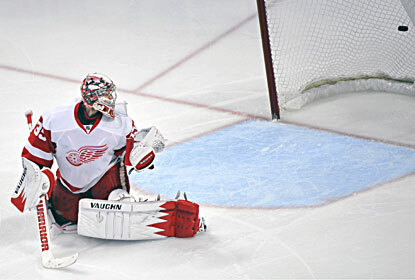 Howard finished with 33 saves.Red Wings forward Pavel Datsyuk was held without a point, closing out an ineffective series for the Russian star.The Blackhawks made it to the conference finals for the first time since it won the title three years ago and will host Los Angeles in Game 1 on Saturday night. The Kings advanced with a 2-1 victory over San Jose in Game 7 on Tuesday night.Pittsburgh will host Boston in the opener of the Eastern finals on Saturday.The Blackhawks were one of the favorites to win the Stanley Cup when the playoffs began, storming to the Presidents’ Trophy during the lockout-shortened season. The Blackhawks then boosted their credentials with a five-game win over Minnesota in the first round and a convincing 4-1 victory against the Red Wings in the series opener.But Howard and Detroit responded with three straight victories, pushing the Hawks to the edge of elimination. The frustrated Blackhawks held a team meeting the day after Game 4, where the seeds were planted for their improbable comeback.They felt one win would turn it around, and they were right.Three victories later – in which the Blackhawks outscored the Red Wings 10-5 after managing just two goals in Games 2-4 – they became the 25th team to win a series after trailing 3-1.It was the first time in franchise history the Blackhawks made such a comeback.Crawford finished with 26 saves, continuing his strong performance after allowing a soft goal that nearly proved costly in Game 6. He was especially tough after Detroit turned up the pressure early in the third.The Blackhawks celebrated wildly when Niklas Hjalmarsson blasted a slap shot by Howard with 1:47 left in regulation, prompting cheers from the raucous crowd.But Hawk forward Brandon Saad and Detroit defenseman Kyle Quincey got tangled up in front of the Red Wings bench. Walkom stopped play to give roughing penalties to both players as the Blackhawks went in for what appeared to be the go-ahead goal.Blackhawks captain Jonathan Toews had a long discussion with one of the officials while the cheers turned to boos as the crowd realized the goal was waved off. The Red Wings then rushed down the ice, and Johan Franzen’s shot was blocked by defenseman Duncan Keith.After a seesaw series with all sorts of twists and turns, the Blackhawks and Detroit faced off one more time in a Western Conference playoff game.The Red Wings will move to the East after this season as part of NHL realignment while the Blackhawks remain in the West. Playing on soft ice due in part to The Rolling Stones concert on Tuesday night, the Original Six teams provided a fitting conclusion to a compelling series.Each side made the safe play for most of the game, clearing the puck away if there was any danger and patiently waiting for the other team to make a mistake.Crawford and Howard were there when anyone got open.The Blackhawks got an opening at the start of the second period when Sharp got Kronwall to turn the puck over while the Red Wings changed lines.Sharp then skated in with Michal Handzus and Marian Hossa and finished a pretty passing sequence with his seventh goal of the playoffs at 1:08.The Hawks and Detroit each killed off a power play in the period while they jockeyed for control, and the Red Wings finally got even at the beginning of the third.Gustav Nyquist made a nice move to get open along the boards and found a streaking Zetterberg on the left side for the captain’s first goal since the Red Wings’ 3-2 victory at Anaheim in Game 7 of the first round.The Red Wings looked ready to duplicate the Blackhawks’ three-goal flurry in the final period of Game 6, dominating the action after tying it up. But Crawford stood tall, turning away every Detroit rush. NOTES—Detroit C Valtteri Filppula didn’t return after leaving in the first period with an undisclosed lower body injury. … It was the third Game 7 between the Red Wings and Blackhawks. Detroit won 4-2 in 1964, and the Hawks returned the favor by the same score a year later. … White Sox 1B Paul Konerko won his matchup with Cubs RHP Jeff Samardzija in shoot the puck after the second period…..Former Bulls star Scottie Pippen and Bears cornerback Charles Tillman both received warm ovations when they were shown on the video board. …The Hawks went 4-0 against Detroit during the regular season. Dioner Navarro’s first home run just cleared the basket at Wrigley Field and his second nearly hooked foul. But the third? 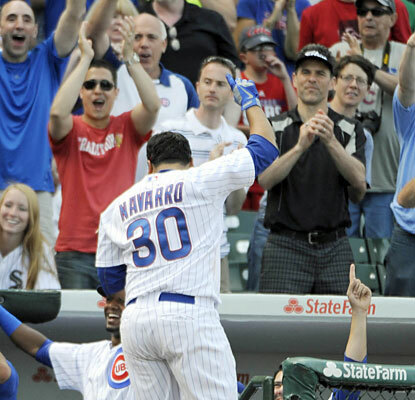 There was no doubt about that one, and there’s no doubt about this, either: This was an unforgettable performance.Navarro hit three home runs for the first time in his career, connecting from both sides of the plate Wednesday and leading the Cubs over the White Sox 9-3. The last time he hit three home runs in a game? “I hit two one time in Little League,” he said, smiling. Navarro had never homered more than once in a major league game, but he sure got his swing going while driving in a career-high six runs and scoring four times. He became the first Cubs player to hit three homers in a game since Aramis Ramirez against Houston on July 20, 2010, at Wrigley and their first catcher to do it since George Mitterwald on April 17, 1974, against Pittsburgh.The last Cubs switch-hitter to homer from the left and right sides in a game was Mark Bellhorn against Milwaukee on Aug. 29, 2002. “It’s a pretty special day, something he’ll never forget,” manager Dale Sveum said. Navarro began the day with three homers in 55 at-bats this season, and wound up doubling his homer total. He raised his batting average from .200 to .241 filling in for Welington Castillo as the Cubs won their third straight.Despite all that, Sveum made one thing clear: He’s not changing catchers. He said Castillo will start on Thursday.Navarro hit a solo homer just over the basket at the wall in left-center in the second to break a 1-all tie and added a two-run shot down the left-field line off John Danks (0-1) in the fourth, with both drives coming from the right side. He walked and scored in the sixth after his bat landed several rows beyond the Cubs dugout.He got the bat back and delivered another big blow in the seventh, driving a towering shot to the street beyond the right-field bleachers for a three-run homer off Brian Omogrosso. By the time Navarro hit his third homer, Feldman was back in the trainer’s room getting his shoulder worked on. That didn’t stop him from “jumping around” on the table as the ball shot toward the street.Clearly, he was thrilled for his teammate even if Navarro stole the spotlight from him. Feldman (5-4) went six innings, allowing two runs and six hits. He struck out seven without a walk and improved to 5-1 in his past seven outings.The strong performance by Feldman came after Jeff Samardzija threw a two-hitter in Monday’s 7-0 win at U.S. Cellular Field. The struggling Edwin Jackson was also sailing along on Tuesday before the game on the South Side was postponed because of rain with the Cubs up 2-0 in the third.In his second start back from a season-ending shoulder injury, Danks lasted just four innings and allowed four runs and five hits. His most recent win was at Wrigley Field on May 19, 2012, which turned out to be his final start of the year. He had surgery in August to repair a capsule tear and remove debris in his rotator cuff and biceps. The bullpen didn’t exactly bail him out. The offense struggled, too. Adam Dunn is now 1 for 25 in his last seven games after going 0 for 3, although he did have a sacrifice fly. NOTES—Kyuji Fujikawa will have Tommy John surgery to repair a torn ligament in his right elbow and miss the rest of the season. No date has been set for the procedure. He said through a translator that he “felt something” on a pitch to Joey Votto during Sunday’s game against Cincinnati and was placed on the disabled list on Monday…..The White Sox will keep Chris Sale on his usual schedule and have him start Sunday rather than move him up a day. Sale pitched two innings on Tuesday before the game was called…..Ventura said 2B Gordon Beckham would play Thursday for Triple-A Charlotte and that he didn’t expect him to come back to Chicago until next Thursday. Beckham, who had surgery April 16 to repair a broken left hand, hasn’t played on his rehab assignment since last Thursday because of soreness….. Jake Peavy (6-2, 2.97 ERA) starts for the White Sox on Thursday, with Travis Wood (4-3, 2.73 ERA) pitching for the Cubs. Hawks explode in third period, beat Wings 4-3. Game 7 Wednesday night. DETROIT—Corey Crawford watched a fluttering puck get past his glove – a soft goal if there ever was one – and the Blackhawks looked as if they were in trouble against the Detroit Red Wings. “I pretty much told myself it can’t get any worse,” Crawford said. Blackhawks ride desperation right into Game 7.The Blackhawks picked up their crestfallen goalie by scoring three times in the first half of the third period to beat the Red Wings 4-3 on Monday night and force a Game 7 in the second-round playoff series between longtime rivals. The Blackhawks got it when Bryan Bickell netted the go-ahead score early in the third, helping the NHL’s top-seeded team earn a shot to advance to the Western Conference finals after Detroit once led 3-1 in the series. The Red Wings also began the third period of Game 6 with one-goal lead.They just couldn’t hold on.Michal Handzus tied it in the opening minute of the final period. Bickell scored about 5 minutes later. Michael Frolik’s backhander on a penalty shot at the 9:43 mark put the Blackhawks ahead 4-2 and silenced the once-raucous crowd.The Blackhawks needed that cushion because Damien Brunner scored with 52 seconds left to pull Detroit within one. The seventh-seeded Red Wings pulled their goaltender, but they were unable to score with the extra skater. Now the series between Original Six teams shifts to The United Center for Game 7 on Wednesday night. “If I would’ve told Detroit and Michigan we would play in Chicago in Game 7, I think everybody would be excited about that,” Red Wings coach Mike Babcock said. “I love Game 7s. Detroit advanced to the second round after winning Game 6 at home and Game 7 on the road against second-seeded Anaheim. Frolik became first player in league history to score two goals on penalty shots in the playoffs. He also did it two years ago against Vancouver. Crawford made 35 saves and Jimmy Howard stopped 24 shots for the Red Wings.The Blackhawks sent the series back to Detroit with a 4-1 victory in Game 5 on Saturday night, and then jumped in front on Marian Hossa’s goal in the first. But Patrick Eaves tied the game later in the period and Joakim Andersson put the Red Wings up 2-1 with a long wrister 10:11 into the second period.Joel Quenneville made the first tactical move by starting Toews and taking him off the ice soon after the puck dropped to get him away from Zetterberg.When the Blackhawks went ahead 1-0 on a power play, both captains were on the ice.Toews won the first faceoff against Zetterberg after the penalty was called, and ended up with an assist on Hossa’s goalmouth scramble 3:53 into the game.Eaves, who revived his career during the lockout-delayed season after having a concussion, scored for the first time this postseason off a rebound 18:51 into the first.The Red Wings went ahead for the first time when Anderson had the puck, which was on edge above the left circle, and flicked a wrist shot that Crawford couldn’t handle. The Hawks got to the front of the net in the third period and it paid off.Handzus was basically by himself when he scored 51 seconds into the third against a helpless Howard. Bickell wouldn’t let Detroit defenseman Brendan Smith move him away from Howard before he scored the winning goal, leading to Howard taking Smith’s stick and throwing it into the corner.Frolik got a penalty try when he had a breakaway after blocking Carlo Colaiacovo’s shot and was hacked by him from behind. He took advantage by scoring easily on Howard’s glove side. “I’ve got nothing to say about that,” Howard said when asked about the call that gave the Hawks a penalty shot. Howard had a lot to say did during the game about it, screaming at an official while the Blackhawks celebrated their comeback that was made possible by supporting players. NOTES—Quenneville earned his 79th playoff win to break a tie with Babcock for the most by an active coach and move past Pat Burns and into 8th place on the league’s all-time list…..The Blackhawks are 5-0 when they score on a power play this postseason and Detroit is 2-6 when it allows a power-play goal…..Pittsburgh Pirates infielder Brandon Inge attended the game after playing against his former team, the Tigers, at nearby Comerica Park and was wearing a Jordin Tootoo Red Wings jersey. 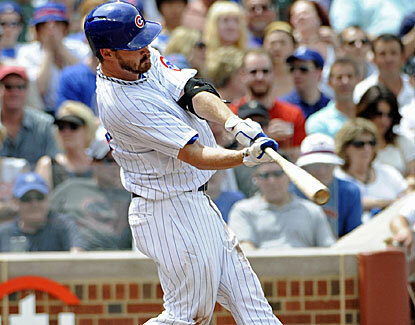 Samardzija blanks Sox on 2 hits, Cubs win 7-0. Jeff Samardzija was at home pitching on the South Side.Samardzija threw a two-hit shutout and Julio Borbon hit a two-run home run and the Cubs beat the White Sox 7-0 on Monday.Samardzija (3-6) pitched the Cubs’ first complete game shutout since Randy Wells shut out the Giants on Aug. 29, 2011. The last time the Cubs shut out an opponent as a team came against the Rockies on Aug. 26, 2012.When ‘prime’ series have ‘no juice,’ interleague play loses its value.The first White Sox hit came from Conor Gillaspie in the third inning. Samardzija then got Jeff Keppinger to hit into a double play as he faced the minimum through four innings.He struck out Alejandro De Aza to end the sixth. He then retired 12 straight before giving up a walk to Tyler Flowers in the ninth inning.He bounced back by striking out De Aza, then after a single to Alexei Ramirez, he got Alex Rios to pop out to end the game. The once anticipated interleague series in Chicago lost some of its luster with the fans as the Cubs entered the game in last place in the NL Central and the White Sox are struggling to play .500. The announced attendance was 30,631 at U.S. Cellular Field.Samardzija who grew up in Northwest Indiana, enjoys pitching against the White Sox. Anthony Rizzo doubled and hit a two-run triple in his first Crosstown Classic and Alfonso Soriano added three hits as the Cubs won two in a row after losing six straight.Cubs manager Dale Sveum was impressed by how Samardzija featured his fastball. It was Samardzija’s first career shutout. White Sox starter Jose Quintana (3-2) allowed four runs and four hits. He struck out five and allowed three walks.The White Sox lost for the second time in seven games.With one out in the first inning, Quintana walked Starlin Castro then struck out Rizzo as Castro was attempting to steal second. Flowers was unable to throw to second because Ramirez forgot to cover second base. Soriano followed with a single off the left field wall to score Castro. “Again, I don’t know if it was the pitcher who made us flat, but there was enough of a lack of focus that needs to be there,” Sox manager Robin Ventura said. In the fifth inning, Borbon hit a two-run shot to right on the first pitch. It was his first home run and the first RBI of the season. Rizzo led off the sixth with a double and scored on Scott Hairston’s sacrifice fly to make it 4-0. In the seventh, Rizzo hit a two-run triple off the center field wall and scored on Soriano’s single to extend the Cubs lead to 7-0.White Sox reliever Nate Jones allowed three runs and four hits in the seventh inning. NOTES—Chris Sale is on schedule to start Tuesday night against the Cubs after missing his previous start because of tendinitis in his left shoulder. The left-hander had no setbacks after a bullpen session on Sunday……Edwin Jackson is the Cubs scheduled starter Tuesday. He is 1-7 with a 6.11 ERA on the season and is 1-4 with a 6.60 ERA in his career against the White Sox. 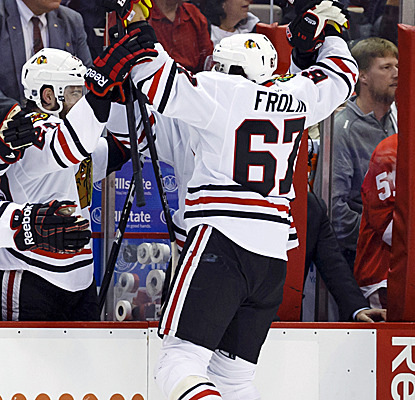 Hawks Power Play, Toews come alive in 4-1 win over Red Wings to stay alive. All that tinkering with the power play, all the practice time and the tweaked combinations finally paid off for the Blackhawks when they needed it the most.Jonathan Toews and Andrew Shaw scored with the man advantage in the second period, and the Blackhawks avoided elimination with a 4-1 victory over the Detroit Red Wings on Saturday night in Game 5 of the second-round playoff series.Shaw added his third career playoff goal in the third as the Blackhawks stopped the Red Wings’ three-game winning streak by creating chaos in front of Jimmy Howard, who had shut down Hawk attack while moving Detroit to the brink of the Western Conference finals. With the sellout crowd chanting “Ho-ward! Ho-ward!” in an attempt to shake him, the standout goalie made 41 saves in another solid performance. But the Blackhawks created enough quality chances that he simply couldn’t stop all of them. Bryan Bickell scored the first goal of the game and Corey Crawford had 25 stops for the Hawks, who managed only two goals during its first three-game losing streak of the season.Daniel Cleary scored for the second straight game for Detroit, which will have another chance to close out the top-seeded Blackhawks in Game 6 on Monday night. That will be at home, too, where the Red Wings are 4-1 in this postseason.Detroit trailed 1-0 before Cleary completed a strong rush during a 4-on-4 stretch in the second period, beating Crawford from a tough angle on the left side for his fourth goal of the postseason. Henrik Zetterberg set up the score by throwing the puck across the crease while Brendan Smith was streaking toward the net.Back came the Blackhawks, who responded with two of their best power plays in weeks. Upset with how the Hawks had been playing with the man advantage, coach Joel Quenneville tried all sorts of combinations in practice to no avail.He finally got what he wanted in Game 5.First, Shaw had a perfect tip on Duncan Keith’s slap shot to make it 2-1 at 13:08. Then Justin Abdelkader received his second penalty, this one for cross checking, and Toews wristed a shot off Howard’s facemask and into the upper right corner.It was Toews’ first playoff goal since April 21, 2012, at Phoenix, snapping a scoreless postseason drought of 10 games. It also came after he appeared frustrated while committing three penalties in the second period of Game 4.The captain was mobbed by his teammates after he skated to the boards, and the crowd of 22,014 roared its approval.The Hawks got off to a good start with a 4-1 victory in Game 1 of the series, but it had been all Detroit since that opening win. The Red Wings turned up the pressure on defense and Howard had an amazing 86 stops on 88 shots over three straight wins that pushed the Blackhawks to the edge of an early postseason exit.Back at home after managing just one goal in a pair of losses in Detroit, the Blackhawks came out with a spirited opening period. Brent Seabrook, who played only 12 minutes in Game 4, and Bickell each delivered a huge hit in the opening minutes, delighting the nervous United Center crowd looking for anything to cheer.Bickell then plowed ahead to set up the first goal since the third period of Game 3. Howard turned away Bickell’s first charge, but he skated around to the other side of the net and was right there to slam home on the rebound when Patrick Kane was denied.Bickell pumped both his arms after he gave the Blackhawks their first lead in a week. It was the fourth goal of the season for physical forward, but his first since Game 4 of the first-round series against Minnesota.The Red Wings then rushed down the ice, and Crawford turned away quality opportunities for Joakim Andersson and Gustav Nyquist. Crawford made 11 saves in the opening period. NOTES—Chicago Blackhawks Charities donated their portion of the Split the Pot money from Game 5 to the OK Strong Disaster Relief Fund to benefit the victims of the recent deadly tornadoes in Oklahoma. 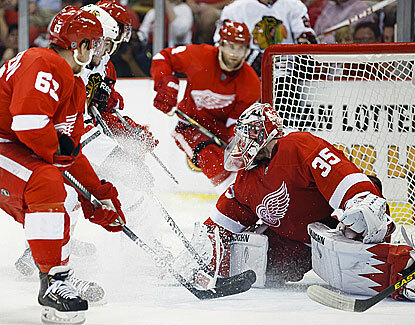 Hawks blanked 2-0 by Howard,Red Wings. One loss away from elimination. DETROIT—Jimmy Howard kept Jonathan Toews in his misery, making three saves against the struggling star to help the Detroit Red Wings beat the Blackhawks 2-0 on Thursday night in Game 4 of the second-round series to put the NHL’s best team during the regular season on the brink of elimination.When Howard wasn’t using his glove or pads to deny Toews, Detroit’s skaters were rattling him and his teammates with a physical presence that is clearly making them uncomfortable. Corey Crawford did a solid job in his net, but he couldn’t kick his right leg out quick enough to stop Jakub Kindl’s shot on a power play midway through the second period and he was on the bench in favor of an extra skater when Daniel Cleary sealed the victory in the final minute.After losing Game 1, seventh-seeded Detroit has surged into control by handing the Blackhawks their first three-game losing streak of the year.Game 5 is Saturday night in the United Center. “The pressure is on them,” Detroit defenseman Jonathan Ericsson said. “We’ve got to find a way to force a Game 6,” he said. The Blackhawks desperately need their captain to score and lead after he extended his goal drought in a composure-crumbling performance.Toews was called for three penalties in the second — two for high-sticking — and could’ve gone to the box a fourth time in the period for slashing Red Wings captain Henrik Zetterberg while an official stood between them. The Hawks had killed its first 30 penalties of the playoffs and matched the 2001 St. Louis Blues’ feat of playing eight postseason games without giving up a power-play goal, the longest such streak since 1988.The Blackhawks had a power play with 4:45 left in the game when Kindl was called for hooking, but they couldn’t tie the game.Crawford made 25 saves and allowed one goal, after giving up seven goals in the previous two games.Howard was just a little bit better, earning his first shutout of this postseason and the second of his career in the playoffs. He has helped the Red Wings win five of their last six games since trailing Anaheim 3-2 in the first round. Kindl scored his first goal of his first postseason, keeping up a trend that has helped the rapidly improving Red Wings pull within a win of their first trip to the Western Conference finals since 2009 when they got past the Blackhawks and went on to lose Game 7 in a Stanley Cup finals rematch against Pittsburgh.Detroit’s young players — six playing in their first playoff season — have been contributing to help out stars Pavel Datsyuk and Zetterberg.Red Wings rookie Brendan Smith scored the winner in Game 2 at the United Center to even the series. First-year player Damien Brunner and Gustav Nyquist, who was pointless in his first four postseason games last year, had goals in overtimes against the second-seeded Ducks.Toews, should seemingly be in the prime of his career, but he is in a slump against a team that appears to be getting to him physical and mentally. Toews was called for three penalties in the first 11 minutes of the first time in his career.He has gone 10 postseason games without a goal — dating to last year’s playoffs — in what is the longest scoring skid for a former Conn Smythe winner since Claude Lemieux went 20 games without a goal from 2000 through 2009.Toews, who has three goals in his last 30 playoff games, broke a tie for his second longest streak without a goal in the postseason and trails his 14-game skid that spanned 2010 and 2011.Joel Quenneville insisted Toews, who he put on a line with Patrick Kane, is doing a lot of things well. 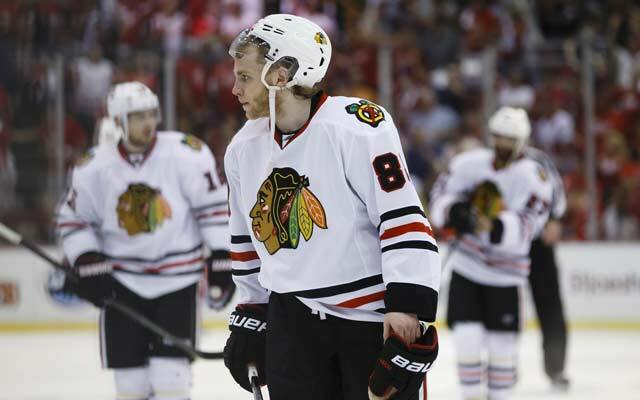 “We don’t measure just his contribution offensively,” Quenneville said. NOTES—Detroit D Danny DeKeyser, who broke his right thumb in the first round and was ruled out for the playoffs, said he is holding out hope that he can come back if his teammates can advance…..Since winning the Stanley Cup in 2010, the Hawks have lost in the first round twice and is a loss away from a second-round exit…..The Hawks hadn’t given up a power-play goal since April 22. 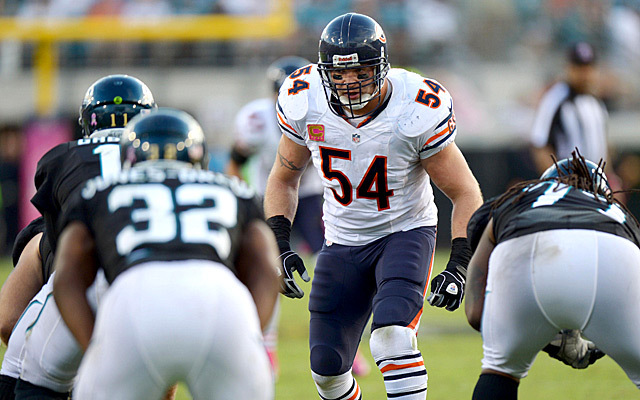 The Bears and Brian Urlacher parted ways in March and now, two months later, the 13-year veteran has announced his retirement. Bears linebacker Lance Briggs admitted this week that he already missed Urlacher, his teammate for the past decade. The Bears selected Urlacher in the first round of the 2000 NFL Draft. He excelled as a hybrid linebacker-safety at the University of New Mexico and quickly became one of the NFL’s best players. Urlacher earned NFC Defensive Rookie of the Year honors, was named to the 2000s All-Decade Team, AP Defensive Player of the Year (2005), and was an eight-time Pro Bowler. He retires with 939 tackles, 41.5 sacks, and 22 interceptions. Wings take 2-1 series lead with 3-1 win over Hawks. DETROIT—The young Detroit Red Wings have made the mighty Blackhawks look vulnerable, beating them two straight times to gain an advantage in their last playoff matchup as Western Conference rivals.Gustav Nyquist and Drew Miller scored 31 seconds apart midway through the second period and Pavel Datsyuk restored a two-goal lead in the third to help Detroit beat the Blackhawks 3-1 Monday night and take a 2-1 lead in the second round series.As good as the Red Wings have looked — scoring six straight goals to earn momentum in the matchup — their hard-driving coach isn’t ready to celebrate. “We haven’t done anything yet,” Mike Babcock said. That’s an understatement. If the seventh-seeded Red Wings keep playing like they are, the top-seeded Blackhawks will have a long offseason to wonder what went wrong in a season that looked like it was going to be special.Who’d have thunk it, but on Thursday night at home in Game 4, Detroit has a shot to put the Hawks on the brink of elimination. Hawk chances will improve if Toews can end his goal-scoring skid.He doesn’t have a goal in nine playoff games, dating to last year. He matched Patrick Kane with a team-high 23 goals in the 48-game, lockout-shortened season.Toews did have a game-high seven shots in Game 3, but Jimmy Howard and his backchecking, shot-blocking teammates wouldn’t let him end his drought. Kane scored 4:35 into the third period to pull the Hawks within one. About a minute later, the Blackhawks celebrated as if they tied the game, but Andrew Shaw’s goal was waved off because he was in the crease.Joel Quenneville said he disagreed with the call that negated Shaw’s game-tying score. “He didn’t touch the goalie,” Quenneville said. Corey Crawford, couldn’t touch Datsyuk’s shot 6:46 into the final period that went in and out of the net before he saw it. Crawford finished with 27 saves.Howard stopped 39 shots.The Blackhawks have lost consecutive games for the first time in nearly two months.The Blackhawks began the lockout-delayed season by setting an NHL record with at least a point in their first 24 games, ended it with a league-high 77 points and avoided having a three-game losing streak. After a scoreless first period in a hot and steamy Joe Louis Arena, Detroit took a 2-0 lead with a pretty goal and a gritty one.Nyquist patiently carried the puck from right to left and waited for defenseman Brent Seabrook and Crawford to sprawl out to make a shot before shooting the puck into the open net. “He’s real good at hanging onto the puck,” Babcock said. Miller crashed the net to stuff the puck into the net after Patrick Eaves got to his own rebound to keep pressure on Crawford. Blackhawks defenseman Michal Rozsival started the sequence with a turnover in the Hawk end.It was a sixth straight goal for the Red Wings, who lost the series opener 4-1 and gave up the first goal of Game 2 before going on to even the series with a 4-1 victory. NOTES—Babcock won his 77th postseason game, matching Quenneville for the most among active coaches and trailing Pat Burns by one victory for 8th place on the NHL’s all-time list….The Blackhawks haven’t given up a power play goal in their first eight playoff games, matching the 2001 St. Louis Blues for the longest such streak since 1988….The Blackhawks put Viktor Stalberg back in the lineup, and scratched Daniel Carcillo, and Stalberg got shook up early in the game, missing a check and going head first into the boards. Rush battle defending Champion Arizona to final minute, fall 7 points short. ROSEMONT—The second-place Rush dropped their third consecutive game this afternoon as they lost to the Arizona Rattlers 56-49 at the Allstate Arena.Rattlers quarterback Nick Davila conducted three textbook drives to begin the game for the Rattlers. The winning quarterback of ArenaBowl XXV was as good as advertised in the first quarter, going 6-8 for 122 yards and three touchdowns; two to Kerry Reed and one to Rod Windsor.Luke Drone started the game under center for the Rush in place of Carson Coffman. Despite the change, the offense proceeded as usual, as Reggie Gray hauled in a thirty yard touchdown to start things up. Despite the fact that Drone was signed mid-week, his time in Chicago last season apparently prepared him well for the game. He converted a 3rd and 19 as well as two fourth downs to keep the offense moving forward in the first half.The Rush offense finally faltered on their third drive. On a first-and-goal from Arizona’s four yard line, Drone attempted to find Jared Jenkins in the back of the end zone, but Arizona’s Virgil Gray stepped in front of the pass, picked it off, and brought it out to the seventeen yard line. Davila made quick work of the Rush secondary, conducting a two-play drive to extend Arizona’s lead to 28-14.The two teams traded scoring drives to wind down the first half. Shades of 2012 were present, as both Reggie Gray and Arizona’s Jared Perry caught touchdown passes. Perry, the 2012 Rookie of the Year with the Rush, was back at the Allstate Arena for the first time since last year’s Week 17 game against the San Antonio Talons. He eventually finished the game with two receptions, both touchdowns.The teams went into halftime with Arizona in front 35-21.The Rush responded to the third quarter bell with a speedy touchdown drive to bridge the gap to seven. Just when it looked like the scales were about fully to tip in Chicago’s favor, Davila connected on a fourth and ten on his own five to extend Arizona’s first drive of the half. Windsor eventually finished the work with his second touchdown reception of the game. Arizona then capitalized on the Rush’s second turnover of the day. Faced with a drive starting on their one yard line, Drone’s pitch to Rodney Wright could not be controlled, and Arizona recovered. One Odie Armstrong run later, the Rattlers extended their lead to 49-28.The Rush did not go quietly. Drone was able to put together two quick scoring drives to keep the Home team within fourteen in the fourth. The defense then finally stopped Davila with eight minutes to go in regulation. A Reggie Gray touchdown catch brought the game within seven, and after kicker Jose Martinez placed the kickoff perfectly off the upright, the Rush had the ball on the Arizona 17 yard line with a chance to tie the game. Despite the incredible momentum shift, the Rush could not muster any points after a fumbled pitch on third and goal pushed the offense back to the 25, and the ball was turned back over to Arizona.Arizona ran out the clock with three quarterback runs, and the Rattlers finished off the Rush 56-49. Nick shined on the afternoon, going 18 of 31 for 301 yards and seven touchdowns.Drone, who started on just one day of practice, went 14 of 34 for 261 yards, six touchdowns, and one interception for the Rush. Receiver Rodney Wright contributed his second kickoff return for a touchdown in as many weeks, going 57 yards untouched midway through the first quarter. The loss drops the Rush back into second place. They travel down south next weekend and will take on the New Orleans VooDoo on Saturday night.